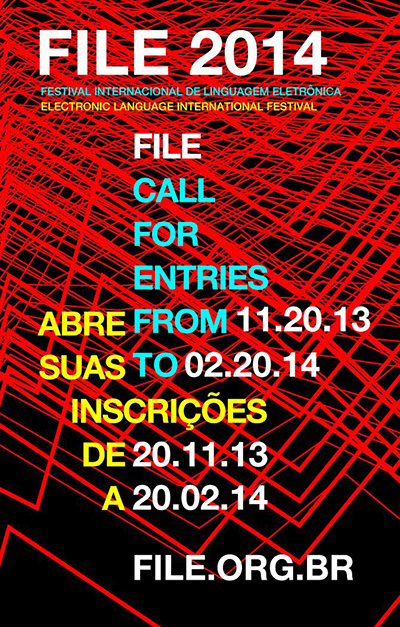 Registration is now open from November 20, 2013 to February 20, 2014 for the 15th edition of FILE – Electronic Language International Festival. Since 2000, FILE is a nonprofit cultural organization that has promoted meeting places for the dissemination and discussion of artistic and cultural productions achieved with various technological tools. For 2014, artists and researchers may submit their work in the three main categories: Interactive Art, Digital Language and Electronic Sonority; besides proposals for FILE Workshop, which aims to disseminate the technology as a means of artistic development. FILE 2014 exhibition will take place at the FIESP Cultural Center – Ruth Cardoso, in Sao Paulo, Brazil, from August 25 to October 05, 2014. It is necessary to fill out the registration form to participate, according with the General Regulations of FILE. For more information on the Festival and Application information, click here.